Review date: 5 September 2000. Do KVM switches make you feel all tingly inside? Do they? Well, if they do, I recommend you seek professional assistance. It's probably not a psychological problem, of course. My bet would be on a poor earth connection somewhere. Exciting they may not be, but the KVM (Keyboard, Video, Mouse) switch is a really handy thing for people who have to deal with multiple computers. KVMs, as they are commonly known, let you plug one monitor, mouse and keyboard into two or more computers. Press a button, see and control one computer. Press another button, see and control another one. This reduces desktop clutter, saves you from annoying plug-swapping in machine rooms full of computers, and also saves quite a lot of money. Common-or-garden KVM switches are a lot cheaper than a monitor, a mouse and a keyboard for every computer you connect to them. Basic mechanical-switch KVM units aren't very expensive - maybe $AU100 for a two-way switch, perhaps $AU140 for a four-way one. These cheapies seldom work well if you want to use higher video resolutions - 800 by 600's fine, but more may not be. But for the money, you can't complain. The reason why you lose video quality is simple enough. KVMs don't have hard resolution limits; they're not like video cards or monitors, that can handle nothing higher than some particular resolution and refresh rate. KVMs don't know anything about the generation of the video signal, or its display; they just pass it through, and all they see is an analogue signal. The higher the resolution and refresh rate, the more bandwidth that signal needs. Cables, connectors and the switching components inside the KVM have bandwidth response limits. Exceed the bandwidth some component can handle, and your picture gets fuzzy. There can also be resonance issues that cause ghosting at higher resolutions. As anybody who's bought a low cost computer monitor extension lead knows, cheap components and/or long video cable runs may well give you a recognisable image on the monitor at the other end of the wire, but it may not be at all pretty. Electronic-switch KVMs are considerably pricier than the mechanical-switch versions. This is partly because of their nifty soft-switch technology - none of that awfully outdated clicky-clicky nonsense, m'dear - and partly because they generally have superior video signal wiring. Use good enough cables with a quality KVM and you can use high resolutions without significant image quality loss. No ghosting, and no fuzziness to speak of either. 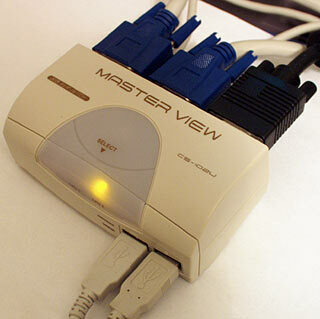 As electronic-switch KVMs go, the Master View CD-102U USB KVM Switch is a cheapie, at less than $AU260. It's only a two-computer unit, but that's all a lot of users need. 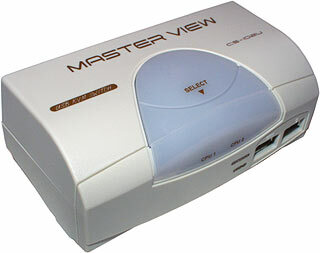 If two computers isn't enough, ATEN International, who make Master View products, also make a four port version, as well as various other KVM switches. Most KVM switches are much the same. One set of connectors for the mouse, monitor and keyboard, two or more sets of input connectors, mechanical or electronic switching. This one, though, is different. The CS-102U doesn't bother with those old-fashioned mouse and keyboard interfaces - it uses, as the name suggests, USB. 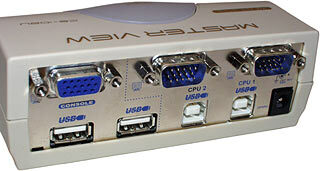 It's essentially a video switcher grafted on to a simultaneously switched four port USB hub. Into those four ports - two on the back, two on the front - you can plug a USB mouse and keyboard, more USB hubs, or as many USB devices as you like up to the rather implausible USB device limit of 127 devices. This is, in practice, probably unreachable, because some USB devices reserve bus bandwidth, so all of the bandwidth's likely to be eaten long before you hit the limit. But it's fair to say that you can connect A Whole Lot Of Devices. Even without an extra hub, the four ports make it easy to switch mouse and keyboard and, say, a USB scanner and Zip drive between two computers. Or you can abandon the K and M parts of the KVM idea completely and keep using a separate keyboard and mouse for the second machine, not bother with a hub, and just switch whatever four other USB peripherals you like. Like most ordinary USB hubs, the CD-102U doesn't need a power supply. But it comes with a big fat power adaptor nonetheless. Leave the adaptor in the box, and the switch runs from the current supplied by the USB port it's connected to at that moment. This runs its switching circuitry, and also powers the USB ports on the switch. In this mode, the switch acts as a "bus powered" USB hub, as far as the computer it's connected to is concerned. In this mode, it has to be plugged into a port on a "self powered" hub, or into one of the root ports on a computer, or you're likely to run out of power if you plug anything but low powered devices into the switcher's ports (a mouse and keyboard should still be fine). Plug in the power pack and you turn the switch into a "self-powered" hub, which means it doesn't need to be plugged into a powered port. Do that, and you can plug higher current devices, including extra bus powered hubs, into the CS-102U. There's only one button on the front of the CS-102U; it occupies the whole of the curved grey panel on the front, and the amber lights that indicate which computer's connected shine out through its translucent surface. Press the button and you switch computers; hold the button down for two seconds and the switch goes into Auto Scan Mode, in which it automatically switches every five seconds. Auto Scan Mode is pretty nifty - if you've got two computers doing things that both need to be monitored (has the defrag finished, has the scene rendered, is there an error message, whatever...), you can turn on Auto Scan Mode and see easily from the other side of the room what both computers are doing, without plugging in another monitor. To avoid causing conniptions to the operating system and any connected USB devices, Auto Scan Mode also disables the CD-102U's USB ports. Press the button again and the switch goes back to normal mode, connected to whatever computer it was on when you stopped it. USB input devices aren't suitable for all computers and all operating systems. Many multi-computer power users have at least one machine that can't handle USB for one reason or another, though it may work fine with ordinary PS/2 or AT connector keyboards (which are electrically the same thing, but just have different shaped plugs), and with PS/2 or serial mouses. For these machines, the CS-102U is just a video switcher, and not very interesting. If you've got USB-capable computers, though, you're in business. Windows 95 OSR2 PCs with the right patch installed and all Windows 98 and Windows 2000 PCs are fine with USB, provided they've got the right hardware. If you don't have USB ports on your motherboard, you can add them with a cheap ($AU65 or so) PCI card, which the operating system recognises automatically. Recent Macintoshes have USB support as well; it's built in on all of the see-through curvy-Macs. Any Mac young enough to have PCI slots should be fine with a suitable USB card and Mac OS 8.1 - or 8.6 or later, by preference. There's more information about adding USB to older Macs here. Linux's USB support isn't really ready for prime time, yet; the yet-to-be-finalised kernel version 2.4.x will have proper USB support, but at the moment the USB support in the latest stable kernel, 2.2.17 as I write this, is flaky. You can "backpatch" 2.3.x USB support into 2.2.x, though; go here to find out how. You need to take the usual precautions in the setup of the KVM-switched computers, if you're switching the keyboard. On PCs, this means going into the BIOS setup and telling the computer not to halt on startup if it detects no keyboard. Aside from that, as long as the PC's able to use a USB keyboard before it runs a USB-aware OS (if it isn't, you'll need to have an old-style keyboard sitting around for BIOS twiddling...), everything should be fine. The switch comes with a couple of hefty combination video and USB cables, with a female 15 pin video connector and a Type B USB plug on one end, and a male video connector and a Type A USB plug on the other. The cables are only a bit more than a metre long, but you can get quality video and USB leads a few metres longer than that, if necessary. The back panel's about as exciting as you'd expect. All PC video gear for some time has used the 15 pin connector, so that shouldn't be a problem. If you've got a G3 or G4 Macintosh, the standard cables will also be fine, because these Macs use the same video connectors as PCs. Otherwise, you'll need a separate Mac-to-PC video connector adaptor. iMacs have a PC-type video output connector, too, but monitor-switching on a computer that's already got a monitor built in is somewhat perverse. Conceptually, this thing's simple enough that you could reasonably expect it to Just Work. But conceptually simple PC accessories foul up in amazing tentacle-flailing ways often enough that I wasn't expecting particularly smooth sailing. Perhaps switching a pile of USB gizmoes on and off all the time would make Windows tie itself in a knot, or something. I was wrong. The Master View switch really does Just Work. Plug in your two computers, and they both detect a USB hub, for which Windows has drivers built in. They also detect any other devices you've got connected to the Master View's USB ports, and you'll need to have drivers for those devices if you hadn't previously plugged them into that computer. Press the button, and ping, there's the image from the other computer, which as far as it's concerned has just had the USB devices plugged into it too. The Master View cables are good enough that there are no significant fuzziness or ghosting problems, even in 1600 by 1200. I don't have a monitor big enough to display any better than that clearly enough that I could see a difference; I think it's fair to say that this is a genuine high resolution switch. Bear in mind that if you need a longer cable, you'll need to pay for a good one, not some light-duty cheapie. Long, cheap monitor extension cables will give you an image which suggests that a Nimitz-class aircraft carrier has parked next door and is illuminating you with every radar it's got. Of course, if you're running different operating systems on the computers you're switching, both of them have to have drivers for whatever devices are being switched to them. Anything USB-capable understands hubs and mouses and keyboards, but there are lots of little USB gizmoes that only come with Windows 98 drivers. Switch one of those to, say, a Windows 2000 machine, and you'll be annoyed by a "Wow! New hardware!" box every single time you switch. Some USB device drivers don't like having the plug yanked while they are, for instance, grabbing data from a scanner or showing the video stream from a camera. Since switching the CD-102U is exactly equivalent to pulling the plug on the USB devices, as far as the computer's concerned, you'll have to be careful if you're using touchy devices. Switch your USB CD burner in the middle of a disc and it's your own look-out, OK? For devices that aren't shunting data around at that moment, though, and basic gear like keyboards and mouses, the CD-102U works beautifully. Hang two more hubs off it and plug in a dozen devices and I wouldn't be surprised if you had to put up with at least a significant pause every time you switched, while the operating system figured out what just hit it. But for most people with only a couple of devices connected to the switch the whole thing works beautifully. Plug and Play monitors are no problem, either; like all decent KVMs, the Master View switch is DDC2B (Display Data Channel Standard, Version 2.0, Level B) compliant, which in English means that it passes through Plug and Play data properly. The CD-102U's a brilliant bit of gear. Plug-and-go simplicity, the ability to switch a squillion devices - which may or may not include the keyboard and mouse, depending on your situation - and high video quality. And Auto Scan Mode as the cherry on top. If USB's not a problem for the computers you want to KVM-ise, check this gadget out. Aus PC Market no longer sell the CD-102U, but they've got lots of other KVMs.